Eesti Gaas, an Estonian energy company, says steel cutting for its LNG (liquefied natural gas) bunker vessel has commenced. Dutch shipbuilding company Damen performed the inaugural cut in the Yichang shipyard in China. The ship will start refuelling Eesti Gaas’s environmentally friendly LNG clients in and around the Gulf of Finland in the second half of next year. 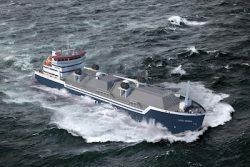 According to Kalev Reiljan, a member of the management board of Eesti Gaas, this will be the only LNG bunker vessel in the northern and eastern reaches of the Baltic Sea. “In essence, we are establishing mobile infrastructure for natural gas as a marine transport fuel in the Gulf of Finland,” said Reiljan. “With this high-tech joint venture, Eesti Gaas and Tallink will ascend to having the title of LNG companies with the most competence and experience in this region. Eesti Gaas has performed over 1,500 port-based LNG truck-to-ship refuellings of the Megastar ferry and now we are moving on toward offshore, more mobile solutions,” he said. Assembly of the ship’s hull will start in May and be completed at year’s end. According to current plans, the installation of the LNG tanks will begin in November and the ship will be launched next March. After sea trials, the ship will be ready to arrive in Estonia in summer 2020 and will start serving LNG clients on the Baltic in autumn of that year.